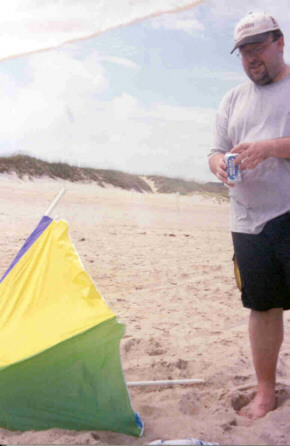 In December 2002, I was invited to participate in a debate sponsored by the Democratic Networking Group. I believe in limited funding for the NEA; my opponent did not. We were asked, however, to argue positions opposite our own. Below are my opening and closing statements, one of my questions during the "clash," and links to photos that help tell the story. My worthy opponent had spent the previous 30 minutes talking to the group about the mechanics of debate, including tips and techniques to become a successful debater. I thought that so much time in front of the group would establish him as a knowledgeable person and undermine my arguments. So, before I gave my opening statement, I asked to make some remarks. Thank you for this opportunity to speak tonight. 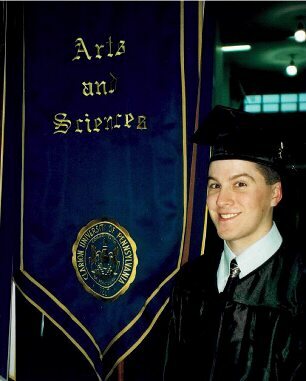 I’m originally from Pittsburgh, Pennsylvania, and I moved here in 1999 after earning my degree in Communications at Clarion University. While there, I participated on the university’s debate team and competed in a tournament at Lynchburg University. Currently I work in communications and public relations for Equal Justice Works, a nonprofit organization that organizes, trains and supports public service-minded law students. I’ll be arguing against funding for the NEA this evening. Now, I realize I’m starting at somewhat of a disadvantage because the gentleman from Moon Township has been talking to you for some time now, so you probably see him as an authority figure. On the other hand, you could be tired of listening to him speak. I turn it back to the moderator. Ladies and gentlemen, take a good look at this picture. 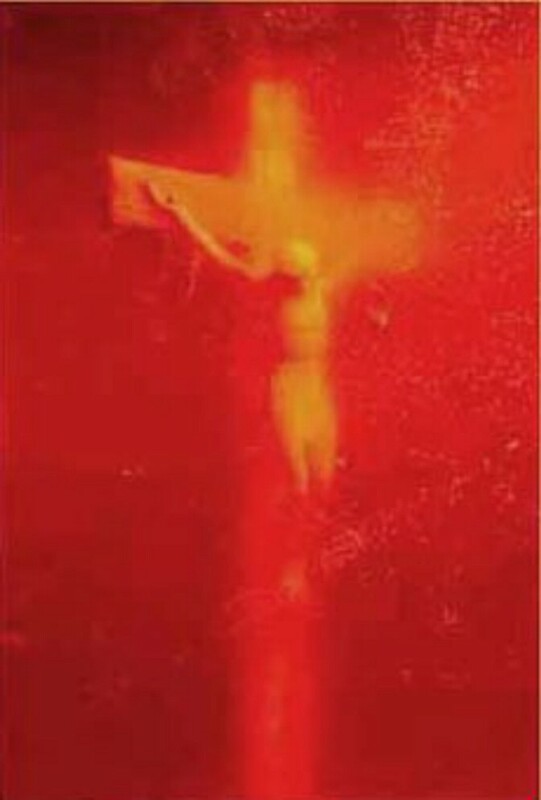 The piece is called Piss Christ and the artist is Andres Serrano. Let me ask you a question. Is this something you would pay for? Is this something you would buy and put in your living room? Regardless, this is something that you, me, and everybody in this country have paid for. Why? Because this was funded by your tax dollars through a grant from the National Endowment for the Arts. According to its website, the NEA was established in 1965 to provide, quote, "national recognition and support to significant projects of artistic excellence, thus preserving and enhancing our nation's diverse cultural heritage." I don't know about you, but I don't recall anything in the history books about the importance of piss art to our cultural heritage. In fact, during the 1787 Constitutional Convention, Charles Pickney from South Carolina wanted to fund literature and the arts, and it was overwhelmingly rejected by the Founding Fathers as not a proper function of the national government. Bureaucrats in Washington should not be left to judge where our tax monies should go in support of such art. Everyone pays for this art, whether they agree with it or not. The art community can produce whatever it likes - so long as public money is not the vehicle for that work. Popular culture comes from society, not the government. Taxpayer money is not required in order for talented and serious artists to produce profound and moving art. The NEA played no role in the creation of Thriller, for example, or the painting American Gothic. The arts can flourish without the approximately $117 million dollars in taxpayer money that the NEA will shell out next year. Our country faces a fiscal crisis and difficult choices need to be made about spending our tax dollar wisely. What is not a difficult choice is removing funding for the NEA. It is unnecessary. Everyday, people like you and me make a choice as to where our entertainment dollars should go. At the most accessible level, you can find examples of art on television. You have the Discovery Channel, which offers Egypt Uncovered and New Detectives, while on A and E, you can watch Biography, American Justice, and, of course, Law and Order reruns. It’s about freedom of choice. You can choose to watch those fine programs and expose yourself to the work of an artist or group of artists, from today, and back to the works of our ancestors. You can choose to visit an art studio and support the artwork of artists you admire or find interesting. You make that choice of where to spend your money. When the government spends your money on which art it wants to subsidize, you lose that freedom of choice. Let’s face it. The average actor is never going to make it and should give up. In this country, you are entitled to the pursuit of happiness. Whether or not you obtain it is something else, and on the subject of the arts, it isn’t a pursuit that the federal government should fund. Last year, according to the American Association of Fundraising Counsel Trust for Philanthropy, corporations and public entities donated an estimated $12.2 billion dollars in support of the arts, an increase of 10% over 2001. Additional taxpayer funds are simply unnecessary. If somebody wants to pee in a jar, that’s their business, but we shouldn’t have to pay for it. Now, one could argue that, as a percentage of the federal budget, funding for the NEA does not amount to much. Here’s another number that doesn’t seem to amount to much. According to the National Coalition for the Homeless, about one percent of the U.S. population experiences homelessness each year. While that seems to be such a small number, it translates into about 3.5 million people, 39% of which are children, according to the Urban Institute. There’s a local program that’s trying to help. They’re called Downtown DC and they provide services and meals to the local homeless population. In fact, I spoke to Louise Davis, their outreach coordinator, at the Church of the Epiphany on G Street, NW. She took a few moments to answer my questions earlier this week, and she told me that each individual meal they prepare for the homeless costs their program about $6. If we were to apply the $117 million dollars we’re wasting on the NEA towards feeding the homeless, that money could pay for over 19 million 500 thousand meals. But only inside the Beltway is $117 million dollars seen as not a lot of money. In fact, that money could also be applied to programs, services or goods that will secure our homeland. According to the testimony of Under Secretary for Science and Technology, Dr. Charles McQueary, he plans to spend just 5 million dollars out of the Department of Homeland Security’s budget this year to develop technology to protect our power grid, computer networks and other critical infrastructure. Just think of what Dr. McQueary could do with an extra $117 million dollars. As Democratic Senator Joe Biden of Delaware recently noted in a statement to the Senate, an additional $150 million dollars is needed for the Department of Energy to help secure our atomic energy defense activities. That money would go towards, according to Senator Biden, quote, “The basic goal of safeguarding our nuclear technology and assets from possible sabotage or theft by terrorist groups.” End quote. The $117 million dollars budgeted for the NEA would almost fully fund this goal. Both of these are better uses of taxpayer money. When was the last time a painting stopped a terrorist attack? Ladies and gentlemen, the choice is clear. We must say no to the NEA and stop this unnecessary waste of taxpayer money. You mentioned the Greek and Roman civilizations. They are no longer the dominant cultures around the world. Just how closely should we follow their example? First, I thank you for taking time out of your busy schedules to attend this debate this evening. As I discussed earlier, continued funding of the NEA is not in the federal interest. Our Founding Fathers considered whether or not an arts program should be funded by the federal government, and they properly decided no. We have first amendment protections regarding freedom of speech from government interference. Conversely, the government should not be in the position of endorsing artwork with taxpayer funds, particularly examples such as the one I cited earlier. As citizens of this country, we are free to vote with our attendance and our funds as to which works of art we want to support. When the federal government interferes with this process, that freedom of choice is diminished. Federal monies are not even necessary. Last year, as I noted, corporations and public entities donated an estimated $12.2 billion dollars in support of the arts, an astounding increase of 10% over 2001. And this during an economic downturn. That figure doesn’t even include admissions and direct sales of art. This country has a long and proud tradition of supporting the arts through private funding. Popular culture should come from society, not the government. Whether or not these are tough economic times, politicians and government officials should always be charged with spending our money wisely, no matter how significant those amounts may be. In this case, that $117 million dollars can do a lot of good. With that $117 million dollars, we could purchase over 19 million 500 thousand meals for the homeless. With that $117 million dollars, we could better fund the development of technology to protect our power grid, computer networks, and other key infrastructure. And as Democratic Senator Joe Biden recently noted, we need more money for the Department of Energy to help secure our atomic energy defense activities. A major catastrophe could be avoided if, instead of art, our federal government properly spent this money to defend the homeland. Ladies and gentlemen, think of it this way. The federal government has been charged with the task of providing homeland security and a social safety net. Each extra dollar forms an extra strand of rope that helps make that net stronger. We need to make sure that our people are taken care of first. We need to make sure that our citizens are protected from the threat of terrorist attack. We should not be spending $117 million dollars a year on something that is more properly left to the private sector to support. The choice is clear. I urge you to support eliminating funding for the NEA and more funding for the homeless and homeland security. Thank you again for your attention.